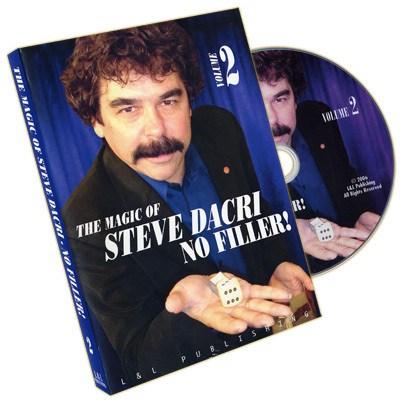 The Boston Herald lauded Steve Darci as "one of the true masters of close-up magic." Bob Hope referred to Steve as his favorite magician. Steve Dacri's 30-year career has included such milestones as headline performances at Radio City Music Hall, showrooms in Las Vegas, Atlantic City and Monte Carlo, and television appearances which include The Tonight Show, Good Morning America, The Merv Griffin Show, That's Incredible and many, many others. Steve has also worked extensively in the trade show industry, putting his expertise to work for numerous corporations. He performed in his own one-man show, Xtreme Close-up Magic at the Imperial Palace in Las Vegas after six years as a headliner at Caesar's Magical Empire. Also, Steve just recently completed his 30th year of performing at The Magic Castle. 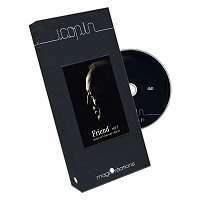 In this DVD series, you'll watch as Steve performs and explains the methods behind the tricks that have drawn raves from luminaries in the entertainment community and eminent people from the corporate world for the last 30 years. This is material that's been shaped, honed and audience-tested until every last bit of entertainment potential has been explored. This is truly commercial magic the kind that people love to watch and that you'll love to perform! SIGNATURE WILD CARD - A magic classic with a personalized twist as the performer's name magically appears on blank playing cards! A perfect opening effect! SPONGE BUNNIES - Steve's touches make this always-popular trick play for larger audiences. MINI-BLENDO - Four small scarves of different colors are placed into the magician's hands and instantly turn into a single large four-colored scarf. Simply beautiful and beautifully effective! COLOR-CHANGING DECK - A deck of cards changes from red-backed to blue-backed . . . that is, all except for a chosen card. However, that, too, changes to blue so that everything turns out right in the end. Easy to do and extremely magical. What's more . . . the deck is examinable at the end and ready for more magic! FOUR ACE PRODUCTION - The magician produces three Aces from a shuffled deck followed by a King. Not willing to accept defeat, the performer magically changes the King into the final Ace. A flourishy way to introduce the Aces that looks impossibly skillful yet is surprisingly simple! FOUR ACE TRIUMPH - A deck of cards is divided and one half is turned face up. The two halves are shuffled together yet the magician manages to magically right the entire deck except for four cards, which just happen to be the four Aces. You'll love Steve's face-up face-down convincer. RAZOR CARDS - Himber's classic routine with the Dacri touch! A card is selected and returned to the pack. The cards are placed back into the box along with a straight-edge razor blade. The box is shaken and when the cards are spilled out, they're all in pieces except for the spectator's selected card. MARTIAN SPONGE BALLS - This is the trick that has taken Steve Dacri around the world. This is, arguably, one of the best and most commercial sponge ball routines ever devised. HAN PING CHIEN - Three coins travel invisibly from one of the performer's hands to the other. A great handling for another magic classic with a subtlety that guarantees spectator interest and involvement. BONUS SECTION - A hilarious clip from one of television's most-loved TV shows. Watch as Steve stars in two very funny segments from Allen Funt's classic Candid Camera. EXPLODING BUNNIES - A single sponge rabbit placed into a spectator's hand literally explodes into a bevy of bunnies when the spectator drops it onto a table. BREAKFAST TRICK - A real-world version of the card to impossible place plot as a playing card, selected under extremely fair conditions, vanishes, only to be found in a sealed box of cereal. INDIAN CUPS & BALLS - A beautiful version of a traditional, but rarely seen, classic magic effect. Small balls vanish and reappear under brass bells in a variety of amusing ways, leading up to an amazing finish. DICE ROUTINE - A chink-a-chink style dice assembly with a difference. Four dice magically travel between the performer's hands with the last die � the Houdini die � escaping from a small metal box before joining the others. SIX CARD REPEAT - Another Dacri-ized version of a magic classic that will keep your audience in stitches. The performer tells the story of one of his first experiences with a magic trick that uses six cards and no matter how many he throws away (or inadvertently drops), he always has six! CARD TO MOUTH - The performer demonstrates his ability to seemingly have spectators select any card he wishes. For the big finish, a signed selection is produced from a very unlikely place! TAKE A CARD - The performer has four spectators each select a card. Three are found to be Queens but the fourth is a Jack. Turning failure into a magical success, the Jack is changed into the fourth Queen. A great demonstration of the Classic Force for real-world audiences. CARD STAB - A card is selected and mistakenly torn by the spectator. One piece of the card is retained by the spectator and the others are discarded in an oatmeal tin. Another card is selected and returned to the deck which is also placed into the tin. The performer introduces a dagger and, after causing the cards to magically jump out of the tin, manages to impale two cards on its blade. One is the second spectator's selection and unbelievably, the other is found to be the first card chosen, magically restored . . . and yes, the spectator's piece fits! CLASSIC FORCE DEMO - Steve Dacri's version of the Classic Force has been hailed as one of the best in the business and in this extensive segment, Steve goes into great detail about his handling of this indispensable tool. Every nuance, including the timing, psychology, choreography and the necessary attitude, is discussed and demonstrated. Learn to do this as well as Steve and you'll be performing reputation-making card magic. BONUS SECTION - Entertaining segments from several of Steve Dacri's many television appearances. Watch as Steve performs on The Dinah Shore Show and The Merv Griffin Show. SUCKER EGG & HANKY - A brand-new take on the classic Silk to Egg with comedy, audience participation and a surprising and magical ending. A spectator is brought up to learn how a magic trick is done and ends up seeing some apparently real magic! And, if you think you know this one already, prepare to be fooled badly! BUNNIES OVER HEAD - In this version of Slydini's legendary trick, large sponge bunnies (and even a huge sponge ball) are made to vanish right before a seated spectator's eyes, much to their amazement and to the amusement of everyone else in the audience who sees exactly where the objects are going! BOWL ROUTINE - Combine Roy Benson's timeless routine with some additional Dacri touches and the result is a routine you'll always use. Sponge balls travel invisibly from the performer's hand to underneath an inverted bowl followed by a magical surprise! COINS THROUGH TABLE - Steve learned this from Slydini, streamlined it with some help from Dai Vernon, and now passes along the real work on this classic of coin magic. COINS ACROSS - Four half-dollars travel invisibly from one of the performer's hands to the other. Steve's version of the Winged Silver plot can be done completely surrounded, perfect for strolling situations. TORN & RESTORED MAGAZINE - The center pages of a magazine are removed, a corner is torn off for verification and the rest of it is torn into small pieces. The performer then restores the pieces and yes, the removed piece fits! Frank Garcia used this to build crowds at a trade show and now it can be yours! CHOP CUP - Steve takes you through every step of his one cup and ball routine, complete with two final loads! CARD IN PANTS - A signed card magically travels to an impossible, improbable � and deeply personal � place! 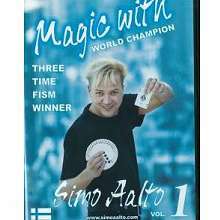 BONUS SECTION - An episode of Steve Dacri's Magic Notebook, a TV show that Steve produced and starred in. 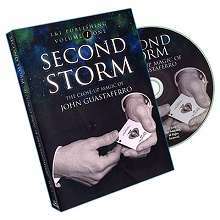 Besides Steve's stage and close-up segments, it also features performances by Dai Vernon (used with permission from the Dai Vernon estate) and Joe Cossari, The King of Cards. 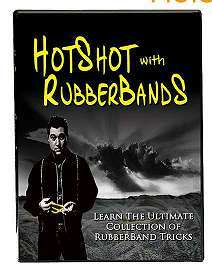 You'll also see the complete infomercial that Steve produced for his Magic Secrets video magic kit that aired nationally.